This condo comfortably sleeps six guests, with queen-sized beds in the bedrooms and a queen-sized sofa bed in the living room. The pleasant island style furnishings and fully equipped kitchen provide an environment where guests can feel comfortably at home. From the living room and lanai, you will enjoy panoramic ocean views and nightly sunsets, as well as sweeping views of the grounds and pool. For indoor entertainment, cable TV and a DVD/CD player are provided. 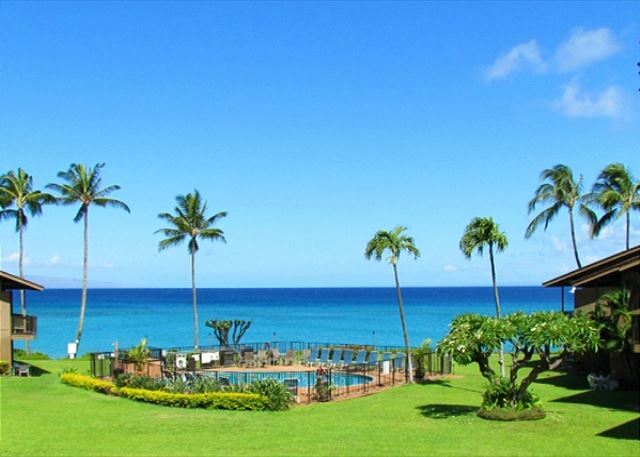 Come enjoy your Maui vacation in our place of paradise. This is a non smoking/ vaping property. Great time as always on Maui. Property needs a little updating but I think everyone involved knows that. Bri was really helpful as always. Place would be "average" without her! Always a pleasure:) See you next year! Once we found Polonesian Shores we never stay anywhere else. We feel comfortable and at home. The pool is wonderful and we love turtle watching in the surf. The staff is great and everything we need is convenient. Parking is so easy. We love it there. You were a special treat Ken:) Come see us again soon! Amazing condos with views exactly as you see in the photo's, great facilities, bbq, pool and turtles all right at your door step. Your family was a joy to have stay with us! Very great accommodations. Bree was truly wonderful and helped us get set up with just the right place. Your family was wondeful to have as our guests... We hope to see you next time you visit Maui! We absolutely loved our accommodations. The condo had everything we needed including cookware that wasn't nasty, which is important to me. It also had very nice bedding, towels and beach towels. The view was terrific. We were able to watch the weekend beach when eating breakfast from our balcony every morning. Also had beach chairs and mats and a cooler and boogie boards. Everything we needed. The staff was also great. We'll be back. We arrived on a Saturday and left on a Saturday. We did all the tourist things and enjoyed our stay at the condo we are looking forward to the next visit. Excellent value with an ocean view. Just a longer drive to much of what we did on Maui than I would have liked. Aloha! Although we do have a very nearby small airport the main airport is about a 45 minute drive across the beautiful coastline. There are many activities do do here in West Maui although being that this is the smaller side of the island most sights are another drive back along the coastline. We are pleased that you enjoyed your stay here on our island! Property and location was perfect for us. Unit 222 could use a carpet replacement. Bree was very helpful and we would stay here again. We have stayed in several units of Polynesian Shores and this was nice also. Love staying here! I have already recommended this place to friends and family. It was very family oriented. I came with my wife and three kids and I'll be back. Quiet, but not too quiet. Staff was super friendly. This was a great stay. 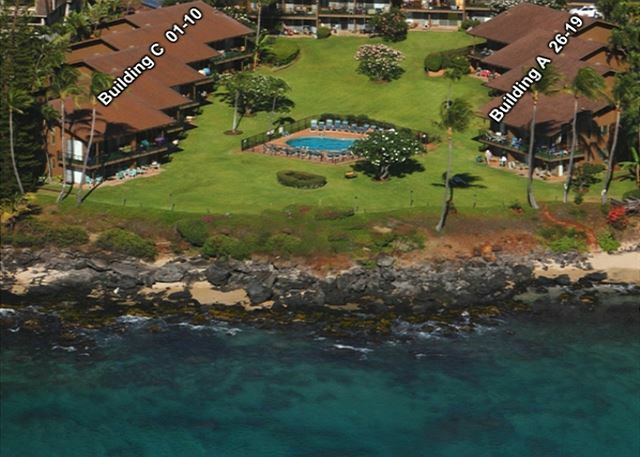 Bree, at the front desk, was so helpful and nice, the unit was beautiful and we loved Maui! It was quite nice, tidy and clean, great location. My only complaint was it was very hot, air conditioning would have been most welcome especially at night just to be able to get some sleep. We love it, thus, we keep returning, beautiful views, friendly, great location. Favorites are snorkeling at Honalua or kapalua, variety of beaches for playing in the surf, viewing many turtles. #222 could use a couple fixes: the hole where toilet is hooked into the wall, and the upstairs medicine cabinet shelves are tippy. Some kitchen items missing such as cookie sheet, full measuring cups and fan in unit needs replacing as well as the addition of at least one more fan for downstairs would be nice. Aloha, Mahalo for your feedback. I will be replacing all items you suggested are missing today and taking a look at necessary repairs. We look forward to your next stay with us! We had a very relaxing and comfortable stay. We had a great view to the ocean and the property was very well equiped with all stuff we need. The unit was in a nicely maintain complex. This particular unit was just beginning to get a bit tired(sliding screen door needs repair,deck sliding door lock not functional, wifi not secure and kept dropping out, some woodwork showing wear and tear, bathroom could use additonal towel rod or hooks for drying wet towels and clothes). Got use to the few ants that showed up only in the morning in the bathroom. I would rent a unit again at the Polynesian Shores, but would try and get another unit that was a bit more updated. Wonderful Maui Stay @ Polynesian Shores! Our trip was wonderful!! The condo was clean and fairly spacious for the four of us. We loved having the full kitchen at our disposal. The view was amazing and we saw turtles every day and liked that we had our own little beach to ourselves. We didn't see the property manager and did put a call in that was never returned but it wasn't for anything extremely important, so not a big deal.